As you can tell, the blog has fallen by the wayside. As everything has its season, the blog was a great way to connect and share our experiences of traveling around and living in Italy. We met some wonderful people and made new friends because of it. But work and other projects left me with little time to keep at it. That doesn't mean I'm not still active writing about Italy! There are posts on My Bella Basilicata, with more to come. And who knows, maybe another blog will sprout up in the future. But for now my focus is on web content, magazine articles, translations, and travel assistance. If you need travel or cuisine-related writing, please contact me! 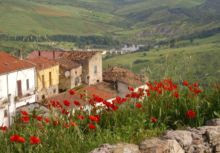 Bryan and I also continue to offer genealogy assistance, journeys, and trip planning to Basilicata through our website, My Bella Basilicata. We'd love to have you come for a visit and see the beautiful region where we live! 2 Baci in a Pinon Tree has received some nice press! *Awarded a spot in the top ten Best of Europe Travel Blogs by Tripbase. My Bella Basilicata. Personalized trip planning, genealogy journeys, and property listings in beautiful Basilicata Italy. Will also write about food, wine, travel, or other topics! If you have a website, newsletter, or other publication in need of content, please contact me. My pen is for hire! Quotes and link-backs are allowed, but if you are interested in reprinting or distributing any of the articles you see here, please contact me first. All content written by Valerie Schneider. All rights reserved. Reprint requires permission of the author. Contact me at thetravelchick(at)hotmail(dot)com for information.